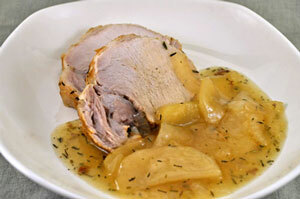 Thyme for Cooking's Main Courses: Lemon Salmon, Pork with Apples, Sausage Risotto. A light coating of mayonnaise, thinned with lemon and olive oil, keeps the salmon filets, moist. 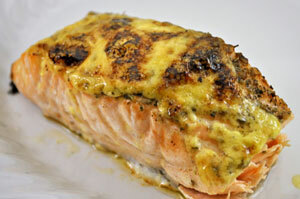 It gets a lovely golden color while baking and infuses the salmon with a fresh lemon flavor. Whisk together the mayonnaise, lemon and oil. Put salmon on a lightly oiled baking sheet. Divide lemon mayonnaise evenly and spread over salmon. Bake at 400 F for 12 - 15 minutes, until top is light brown and fish flakes easily. Serve. Not a traditional meat for hash but the perfect way to use up the leftovers from a braised pork. Toss in any leftover gravy or sauce and you have a moist hash with a bit of caramel crunchiness from the sautéed vegetables. Cut the potatoes - the long way, first in half, then in half again. Now slice (the short way) about 1/8" (.25cm) thick. Cut the carrots in quarters the long way then slice the same thickness as the potatoes. Cut the celery in half the long way and then slice the same thickness. Cut pork into 1/2" (1cm) cubes. Heat 1 tbs oil in large nonstick skillet over medium heat. 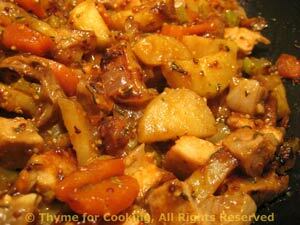 Add carrots, potatoes and sauté for 5 minutes. Add 2 tbs chicken stock, cover and cook for 5 minutes. Uncover and add onion, garlic, celery. Turn heat to medium-high. As chicken stock cooks off, vegetables will start to brown. Once they are starting to brown, reduce heat to medium, add paprika, thyme, pork and mix well. Using a spatula stir and flip vegetables occasionally until they are all nicely browned and done. If using leftover sauce: Stir mustard into sauce. Add to skillet, stirring until well combined and heated through. If using chicken stock: Mix stock, rosemary, cornstarch and mustard. Add to skillet as above. Mushrooms soak up the flavors they're cooked with, and when simmered with a bit of sherry, they turn simple chicken breasts into an elegant, gourmet dish suitable for guests... or just a delicious mid-week treat. For a dinner party I would use the cream... Midweek I use the milk or stock - which is what's on the List. Add chicken breasts and brown on both sides, about 10 minutes total. Add mushrooms and vinegar to pan and sauté 5 minutes. Add sherry to mushrooms and scrape up any browned bits. Return chicken to pan, turn heat to low and simmer 5 - 10 minutes, until chicken is cooked through. Sprinkle chicken breasts with cheese and cover briefly, just until cheese melts. Remove chicken and cover with the pan lid to keep warm. Increase the heat to medium high and add the milk to the pan. 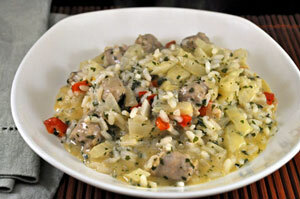 Boil rapidly, stirring, for about 3 minutes, until sauce has reduced and thickened. 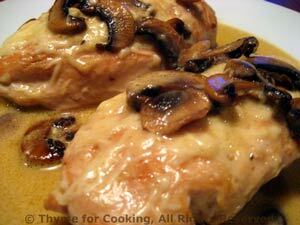 Spoon mushroom sauce over the chicken and serve. The squash bakes while the stuffing is prepared and just needs 10 - 15 minutes to finish. I usually can't get all of the stuffing in, so I keep it warm and serve it on the side. This stuffing has a bit of an Asian influence with toasted sesame seeds stirred in at the end. Chop the onion and celery; mince the garlic, ginger if using fresh. Heat the oils in a nonstick skillet over medium heat. Sauté the onion and celery 5 minutes then add the garlic and ginger if using fresh. Sauté 5 more minutes or until onion and celery are tender and starting to brown. Add beef and sauté, breaking it up as it browns. Add soy sauce, vinegar, powdered ginger, beef stock and stir well to combine. When beef mixture is simmering stir cornstarch in, a little at a time. (You may not need it all). You want it quite thick but not paste. When done add rice, sesame seeds and stir to combine. 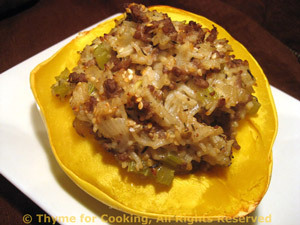 To assemble: When squash are ready (they should be almost done) remove from wherever they cooked and fill with the rice/beef mixture. Bake uncovered for 10 - 15 minutes, until stuffing starts to brown and squash is done. Note: If the stuffing doesn't all fit (depending on size of squash) keep it warm and serve on the side.